Jagruti's Cooking Odyssey is truly honoured to have Sayantani Mahapatra , our second guest host of You're Invited Season 2 ! In the bloggersphire she known through her marvellous blog A Homemaker's Diary. Awesome blog with creative and striking recipe pictures and scrumptious recipes ! Not only her authentic Bengali recipes but recipes all over the world will make you drool...She is a mum, enthusiastic cook, caring friend and a wonderful human being....I came to know her through blogging and we became good friends on Facebook. When I invited her for this event and asked her to do a guest post for me, without any hesitation she said Yes :) and I really appreciate it. Let's meet Sayantani and see what treat she has created for all of us on this Valentine's Day. I promise you it will be amazing, delightful and heavenly !! They say first impression is the lasting impression but in my book first impression is the most memorable one. Every time I think of Jagruti I think of that Blue chiffon saree cladded girl dancing in the snow. If you don’t trust me then you must go and see her post where she braved the freezing cold and wanted to live the Bollywood dream her way. I loved that fun loving girl that day and I love the woman I made friends with on Face book later. Though I have not met her in real but I can bet my life on the fact that she is very compassionate person and has a very creative soul. What all you see in her gorgeous appearance is what all you get. She is an avid baker and my jaws dropped the very first time I saw her baking tiger buns. Those days hardly I knew anyone who would have tried that but she did and so so successfully. So when she invited me to guest post on her page I was really touched. And what else can I share but another baked goodie with my amazing baker friend. 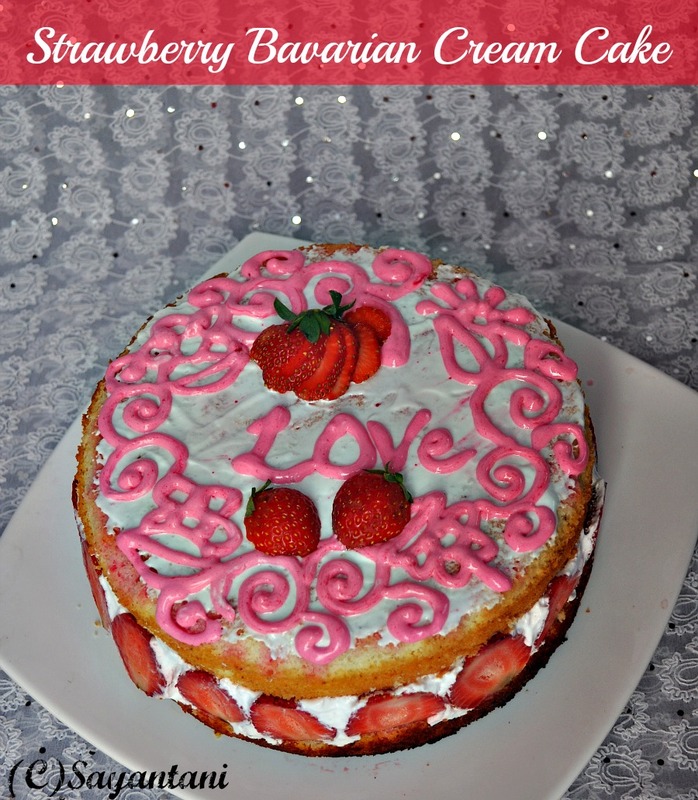 So here it is my humble attempt at Strawberry Bavarian cake. The cake definitely involve some advanced skill and I cant say that I did justice to it but still here is the fruit of my love and labour which tasted amazing. Preheat the oven at 190C. Grease and line one 8” spring form pan. In a clean bowl start whipping the eggs using your hand mixer. Beat for 2-3 minutes till its creamy then pour in the sugar, vanilla and on medium heat beat for another 7-8 minutes till its airy and achieve a mousse like consistency. Add ¼ of the flour and gently fold in the mixture. Please do not whip at this stage or you will knock out all the air you achieved by whipping it. Carefully fold in all the flour in small batches. The Batter would be fluffy and light. Immediately pour in the prepared pan and bake for 30-35 minutes till a toothpick inserted in the centre comes out clean. Let it cool in the pan for 7-10 minutes and then invert on a wire rack which is a very important step for avoiding a soggy cake at the bottom. Carefully remove from the pan and let it cool down completely before slicing it horizontally in 2 layers. For ease of work bake the cake a day earlier than you plan to assemble it. In that case wrap the cake or the slices in plastic wrap and store in fridge. In a small bowl take little milk and sprinkle the gelatin on top. Let it bloom. Pour the milk in a heavy bottom pan and let it come to a boil. Take off heat when the milk is ready, gently and slowly while whisking, pour the heated milk down the side of the bowl into the egg mixture. Put this on heat again and whisk continuously till it starts to thicken. Its ready when it coats the back of a spoon. Take off heat and add the bloomed gelatin. Whisk again to make it smooth. Finally sieve it through a fine mesh and pour in a clean bowl. Directly press a big piece of plastic wrap on the surface and let it cool in the fridge. In the mean time whisk the cream (I used Rich’s) with the rest of the sugar till soft peaks form (5-6 minutes). Once the prepared cream is cold to touch (at room temperature) gently fold the cream into it. Use a spatula and be real gentle. Fridge for an hour to set it. To assemble neatly slice the cleaned strawberries in half. Keep aside. Add 4 tbsp of sugar and ½ tsp of lemon juice in ½ up of water. Mix to get a sugar syrup. Line the spring from tin (in which you baked the cake) with butter paper. Place the top half of the cake upside down in the pan. Sprinkle the syrup to moisten it. Take the halved strawberries and gently press them down the sides of the pan. Make sure the bottom touches the cake underneath. Pour the cooled (whisk it once again to make it smooth a pourable) Bavarian cream in it. Be careful not to pour or mess the sides or you will end up with an ugly looking cake later. Once the strawberries are covered level the cream and smoothen the top with a spatula. Moisten the other half of the cake and gently press it upside down on it. Wrap the whole thing in plastic wrap and cool in the fridge at least for 4 hours. Gently unmold and decorate as per your wish. 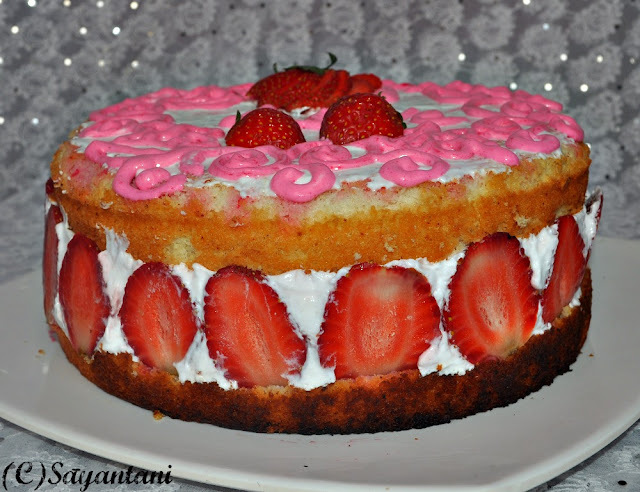 Many many thanks Sayantani for conceding to write this excellent post and sharing with us this fascinating and luscious berry cake recipe. I've already tried your Bengali delicacy Peyaji ( onion fritters ) and they were delicious ! Definitely will give this cake a go, although I'm not sure I can make it as good as Sayantani!! thanks a ton for your sweet words. so glad to be a part of this. Beautiful,gorgeous,elegant and more and more,have no words to express how delicious this cake would have tastes na..Beautiful guest post by Sayantani. Wow! I love the cake. It looks so very delicious. Delicious and yum post Sayantani. Thanks Jagruti. I would like to know about how to make the cake icing nice and stiff so that its easier to pipe it out of the piping bag? I mean what can be added to the ream while beating it?